Are you a teacher, a scrapbooker, a planner, a crafter??? I remember back in the day… like way back… thumbing through books of clip art. That’s right- paper books filled with cute images, words, and more. We would xerox copy the page with an image, then cut (with scissors mind you) the image out and stick it with transparent tape to the place on the page we wanted it to be. We would do this until the project was complete and then proudly make copies of the final mashed together project. Usually, it was the youth group newsletter that I was working on. Back in the day- you know- like 20 years ago. Sheeesh I feel old. Well friends- the world of clip art has certainly changed. Etsy, Teachers Pay Teachers, and other shops online are filled with all sorts of digital masterpieces just itching to brighten up your work! I started making clip art when I was actively blogging on my homeschool blog. I was making free printables to share with the larger teaching/ homeschool community. I learned to make my own images in a format that was helpful in creating these printables. Now I have my own online shops, selling my creations. I also use Clip Art to make the FREE planner printables you find on this blog as well as the digital and paper sticker sheets you find in my Etsy Shop. Not all of us have the time or energy to create our own clip art- which is perfectly fine- let the clip artists help you out! Ok.. back to the point of this post. 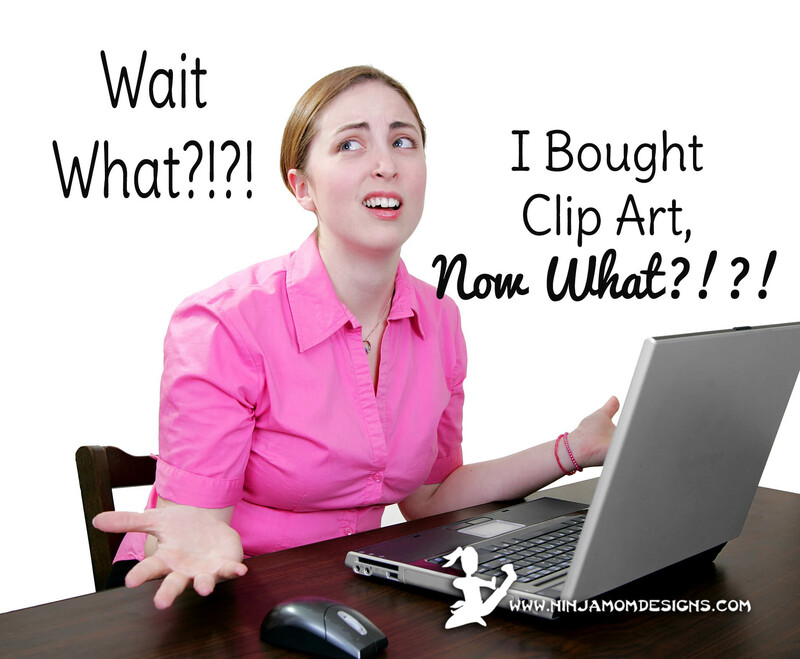 You’ve bought some clip art online- now what are you going to do? First of all- before you click “purchase”- READ the description. Be sure you know what you are purchasing. 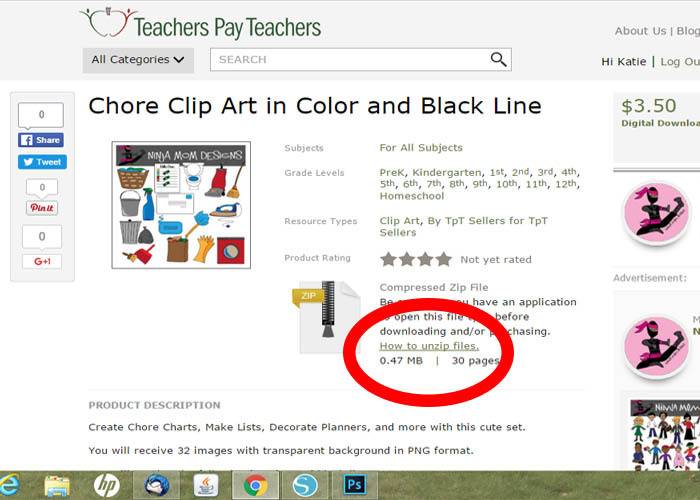 Generally, when a product is marketed as “Clip Art” you will be receiving a package (generally in a zip file) of images. You are not buying an already put together digital print- that is something entirely different. I’m going to use the following set as an example. This is my Chore Clip Art Set. If you were to purchase this set from Etsy or Teachers Pay Teachers, you would receive the link to download shortly after purchasing. When you download the file, you will discover it is a zip file? 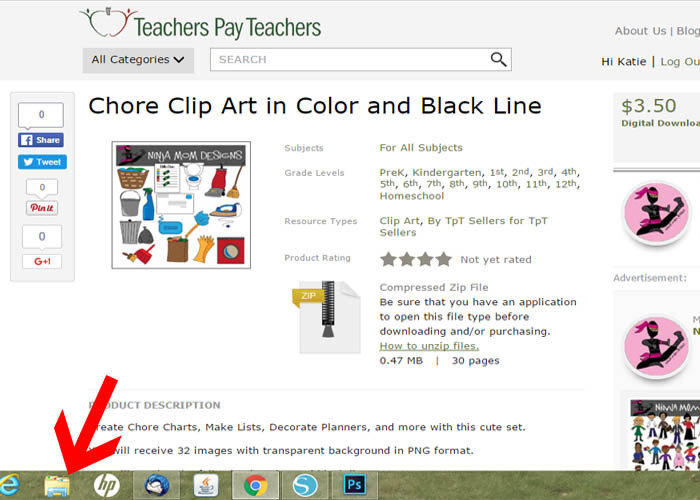 Teachers Pay Teachers even has a place to learn how to unzip a file! Why a zip file???? Well- rather than upload all those individual images to the store listing, clip artists compress the entire package, making it smaller and easier to manage. Don’t you worry- you are still getting high quality clip art! You’ve clicked download. Do you know where your file went???? 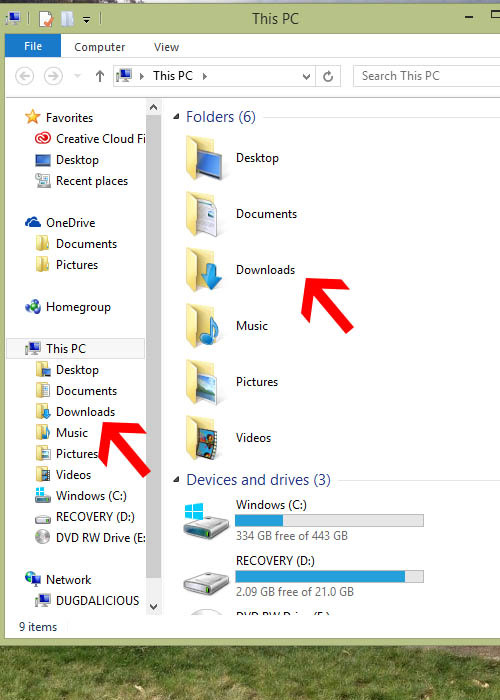 If you go to the file manager (usually a little file folder looking icon on the bottom of your computer screen), look to the left on the menu bar and find the word “Downloads.” Your file is there, waiting for you. You can now move it where you want it to be- I have a removable USB drive where I keep all my clip art files. 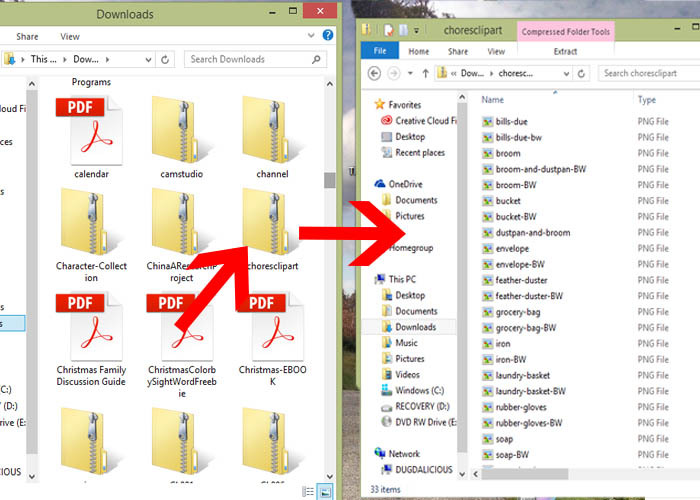 Generally, I open my downloads and click on the zip file to reveal all my files. Then I move said file to their new home on my thumb drive. Now- what you do from here- that’s up to you! I have used the chore clip art to make a number of projects like the one pictured above. Whatever program you are using to create- Word, Google Docs, Power Point, Avery Sticker Design and Print, Scrapbooking Software, etc… there is an option to insert a file. Click that option and find your clip art. Place it in your document as you see fit. A PNG file will have a transparent background, a JPEG will likely have a white box behind it. When you preview a PNG, it might have a black background… but that black will not show up in your project. I’ve invited some other clip art friends to share their thoughts on this subject as well. Check the linky below and learn from the best. Thank you for this lovely article! !